Today feels like a holiday already. People started arriving last night, and my darling Danny will be here this afternoon. I'll be making beads today, but probably won't get a lot done with all the action happening around me. I don't mind. I'd rather play anyway. I got up early and made the cranberries for tomorrow's feast. I love making them, and of course I change up the recipe on the bag a bit. I cook them in apple juice instead of water, with some grated orange zest. I used to try to substitute honey for sugar, but now I figure that's kind of pointless. Some days I just go ahead and eat the white stuff. If you've never made fresh cranberries, I so recommend that you try it this year. They're far superior to the canned ones, and really easy to make. I love how they roll around in the saucepan, and then begin to pop, pop, pop and make a lovely pink foam that quickly cooks down to a rich molten ruby goo that smells just fabulous, and thickens up nicely in the fridge. I always make way too much - a huge bowl full - because I happen to like them a lot. I treat them more as a side dish than a condiment for the turkey I don't even eat anymore. You can keep the bird. I'll take the trimmings. Lauren usually helps me make the cranberries, but she can't be here this year. I'm missing her, and Julia too. But Lucy sat right by me as I stirred the berries this morning, filling in as cook's helper. She even ate a raw cranberry when I tossed it to her. What a weird dog. But I think Lauren will like knowing that her pal Lucy did her best to save Lauren's place for next year. This year is kind of strange and unsettled, but it's still... fun. I'm having a lot of fun. And cranberries. Cranberries are a condiment lol? Never have been for me! Have a blessed Thanksgiving my crafty friend! 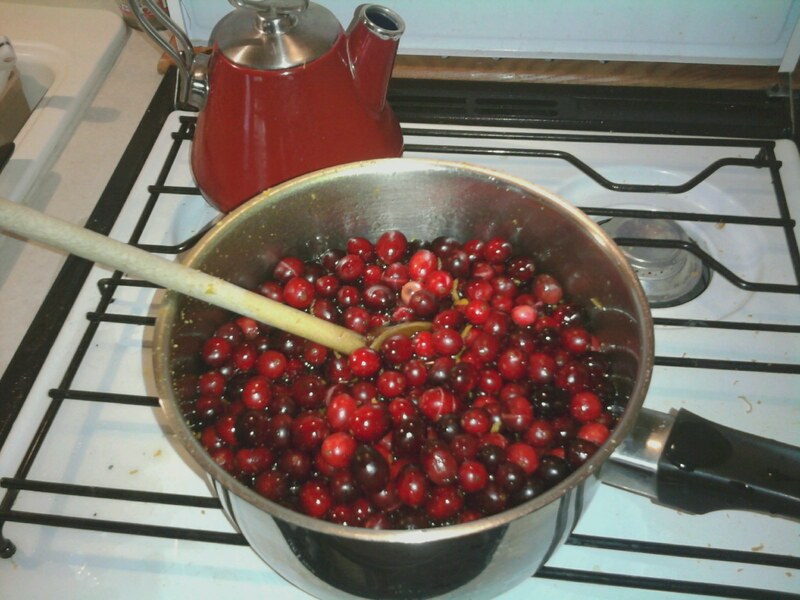 I agree Kim, Cranberries are really LOVELY fresh, just as you make them, that's how I like them too !! !